Announcement Modern, clean, FUN designed Invitations, Announcements and Holiday photo cards and printables. All designs can be customized or altered to suit your needs. All designs are for the digital, printable files that you can choose to print on your own or take to a professional printer near you. I also work with a trusted professional printer and can manage the printing of your cards for your convenience. Welcome to Photocard-Designs.com's ETSY STORE. Photocard-Designs.com has been in business since 2007 with a full functioning website but decided to come over to etsy! My domain name was taken so my ETSY store name is PHOTOCARDDESIGN. Modern, clean, FUN designed Invitations, Announcements and Holiday photo cards and printables. All designs can be customized or altered to suit your needs. All designs are for the digital, printable files that you can choose to print on your own or take to a professional printer near you. I also work with a trusted professional printer and can manage the printing of your cards for your convenience. IRISH BLESSING Tag, St Patrick Printable, St Pattys, Beer Tag, St. Patricks Beer, Irish blessing, DOWNLOAD PRiNT ToDAY! Camping Bottle Label, Camping Party, Camping Water Bottle label, Water Bottle, Camper, Party, Digital, Printable, DOWNLOAD & PRINT TODAY! 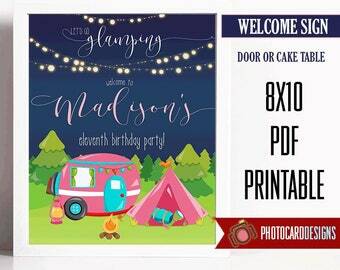 Camping Food Tent, Camping Party, Camping, Camping Printable, Food Tent Printable, Party, Digital, Printable, INsTANT DoWNLOAD, PRINT TODAY! 3 easy steps! Buy, Download after proof approval, Print!! As a military family, I know the importance of staying in touch with your family and friends around the world! Our photo cards are a fun and unique way to do so! I've always had a passion for crafts so when I discovered scrapbooking, I had found my true passion. That passion turned to digital photo's and scrapbooking. I had found my niche! I enjoyed creating cards and loved doing them for other people! That's how PhotoCard-Designs was created in February of 2007! All designs are created from scratch. We do offer matching items and always adding new items. Sign up for our newsletter and/or come "like" us on Facebook to receive special discounts through out the year that only subscribers will receive! If you don't see what you are looking for, please contact us! Welcome to PhotoCard Designs, a home-based business specializing in custom Photo Cards for any occasion. My name is Crystal and I&#x27;m the owner and designer! Photocard-Designs was started as a website in 2007 and then moved to Etsy in 2013!